I have a .vipb and .vipc files for my project. It was building the packages earlier, but recently I have changed all my project files and reusables to packed library. 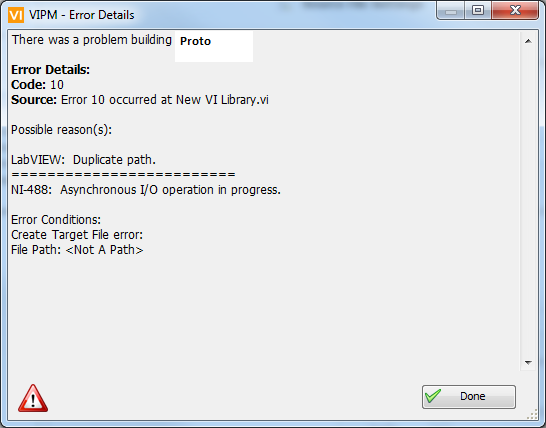 Now I am getting Error 10 while building the package. But I am able to build the package successfully, If I rename/delete the .vipc it it is building properly. Which version of VIPM are you using? I think we made some improvements to VIPM 2018 (and the f1 release) that improve support for PPLs. Thanks for your response. I am using VIPM 2016 SP1. Is that a known issue in VIPM 2016? I can't point you to a known issue, but there's a good chance we've fixed the issue you're mentioning.